Nickelodeon Holiday Gift Guide Review! Looking for the coolest gifts for your kids this year? 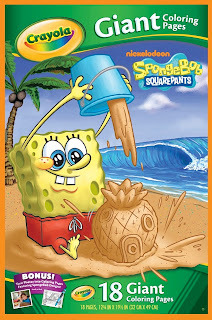 Make sure to check out all the great things Nickelodeon has to offer! From toddler beds to coloring books they have you covered! With great quality, and great designs both you and your young one will be happy! With our youngest finally ready to make the switch we could not be more excited about the Dora Toddler Bed! Normally I am not a HUGE fan of Dora products mainly because of the colors, but I was really impressed with the toddler bed I received. Another thing that I was impressed with was how simple it was to put together. In about 30 minutes the bed was ready for my toddler to jump in and go to sleep. I know a lot of us want our toddlers to have the nice wooden beds, but with the price and how plain they are I’m not sure its worth it. 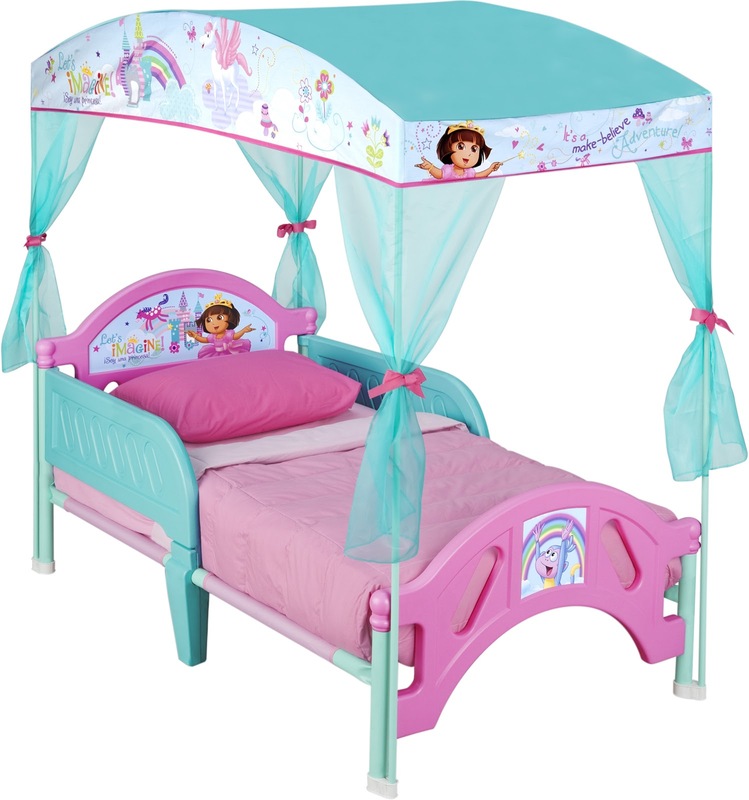 With these beds not only do they last a long time, but they are inexpensive and have your childs favorite characters on them. Our oldest daughter has had this same bed with a different character on it for over a year and it is still standing strong, so you really get your monies worth with these beds. 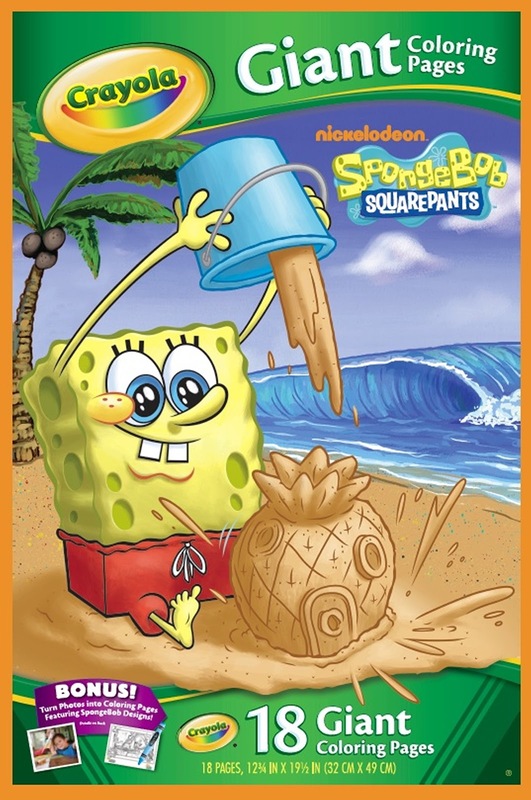 Another thing my girls were excited about was the Spongebob Squarepants Giant Coloring Pages coloring book. My girls love to color! One breaks the crayons while the other one eats them, which is pretty awesome but a big mess. I love the Giant Coloring Pages because they can both color the same page without getting upset about having to share. There is plenty of room for them both to color! 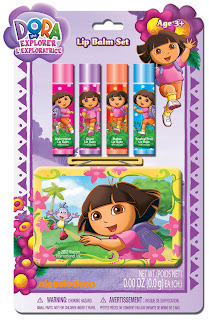 It also has a code on the package that lets you create coloring pages from your favorite photos. I think it would be awesome to let the girls color our favorite family photo. 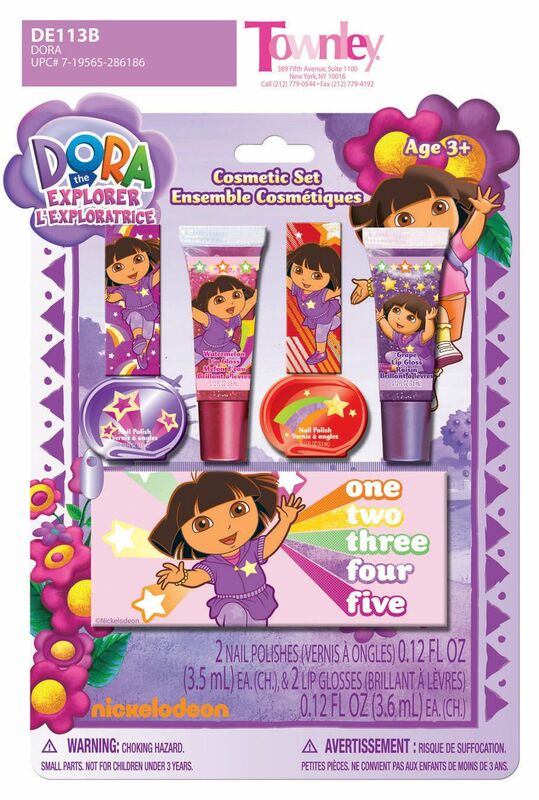 Lately my 2 year old has been absolutely obsessed with my makeup so I have been searching for a good makeup kit for her. Nickelodeon offers a great makeup set called the Winx Club Glam Makeup Case. I love how solid the case is! It was definitely not something I expected! I also love that it comes with makeup applicators. My little one is always trying to take my makeup brushes to use with her pretend makeup. Another thing that is great about this case is that you can place all your little ones other makeup products underneath the slide out palettes. This will be keeping my daughter entertained for hours! This is something that you won’t regret buying that’s for sure! One of my daughters obsessions other than just makeup is lip balm. I was very happy when I saw this next set. 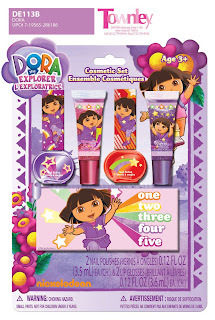 Not only does this set come with 4 different lip balms with Dora on them, but it also comes with a little tin to hold them in. My daughter is obsessed with purses and things so she is super excited about the tin. I’m glad that this set comes with actual lip balm too! We got a makeup set not too long ago that came with lip jelly. I’m still not quite sure what lip jelly is, or how to get it out of my carpet so this set makes me really happy! It also comes with different flavors so your little one can choose their favorite! Mommy is obsessed with having her nails painted, so of course the girls want to paint theirs too. Since they can’t use mommies nail polish this next set is perfect! This is the Kiss It Paint It set. It comes with two bottles of nail polish and two tubes of lip gloss and something to carry them with. I love that the colors are not too bright so my girls can paint their own nails, and if they mess up its not a big deal. It is also really thick so that if the bottle tips it wont spill everywhere. Another great thing about these last two makeup sets is that they are very inexpensive. 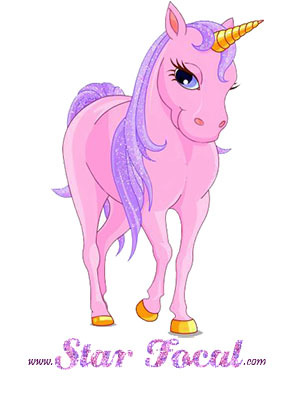 You don’t have to spend a fortune to make you princess happy. 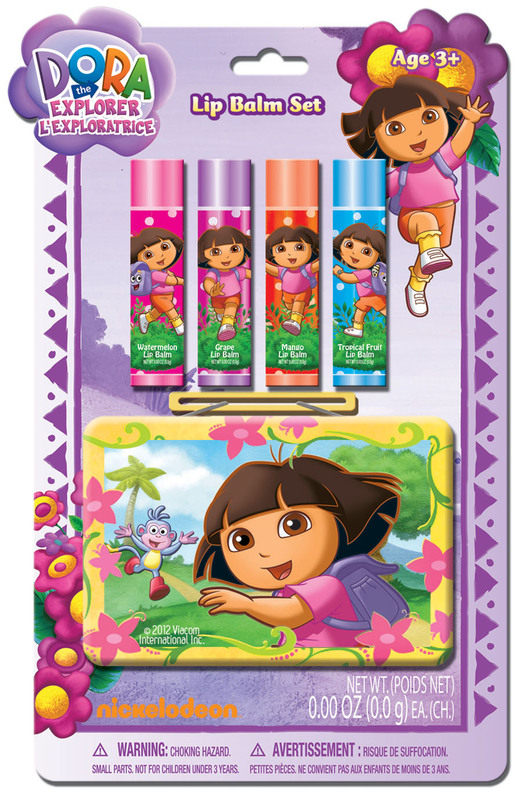 You can find these and other great Nickelodeon toys at a store near you! Or you can find Nickelodeon on their Facebook, Twitter, or on their website here. That toddler bed is so cute! I can’t wait to have kids so I can buy cute beds! Plus, the kids can decorate them with stickers and it won’t be a big deal! I want that coloring book for myself! Great review!